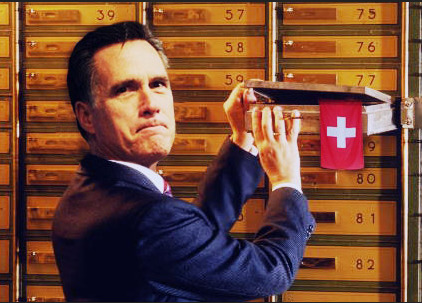 I'm honestly starting to wonder if Mitt Romney will concede the election before election night. Is he finally seeing what the nation sees? The negatives about him, as they in Washington, are so pronounced. Yesterday, facing relentless criticism from the Obama camp about his offshore investments, Romney spluttered that they are managed by a blind trust and he has no knowledge of their whereabouts. Really? If you owned untold millions in investments abroad wouldn't you want to know where they were and how they were performing? Wouldn't you want to have their telephone number at least so you could cal them up if you were feeling anxious? Imagine being so mind numbingly rich that you don't even have to trouble yourself worrying with those details. No wonder Romney's own conservative chums winced so much when he was photographed jet-sking at his private summer mansion last week. Except the portrait that's emerging of Romney is of a human weather vane who will turn with every political wind that blows. Another portrait is of a man so rich and so cossetted that he need never concern himself about where his untold millions are stuffed. Imagine being so rich you don't need wonder where the money that makes you rich actually is? This is the man who feels the pain of America's middle class? Voters are unenthusiastic about him polls say, and he looks decidedly unenthusiastic himself. Even Republican House Speaker John Boehner said recently that voters 'probably aren’t going to fall in love' with him, adding that only 'some friends, relatives and Mormons' have his back. I'm not even sure at this point why Mitt Romney wants to be president. I mean, I suppose for the access to all that power, that must be attractive to him, but when I look a him I still strongly get the feeling his heart just isn't in it. Looking at him, I get the inescapable feeling that his best days are probably all behind him. Like a lot of men from his generation I believe he was probably happiest in the days when he could lead a bunch of bullying frat boys into the unpopular gay kids room and hold him down and humiliate him for life. In those days you could do things like that safe in the knowledge that kind of treatment would never happen to you. In those days he was a king and he acted like one. I bet he misses those days. Nowadays I get the feeling that what he really wants, at this stage in his life, is a jet ski vacation and some nice comfy slippers. He has that hangdog look that makes me think he's been put up to this presidential run against his will, he has that look even more than George W. Bush did. That's why conservative outlets went nuts when those photographs of Romney on his jet ski looking like he was actually enjoying himself for once hit the web. They told the truth about him, for once. The truth is he's happiest goofing off with his family. I wonder if he knows it himself? I really wonder if he'll throw in the towel before the election even starts?